The Marine Mammal Center : Evader Evades Us No More! Evader Evades Us No More! An entangled California sea lion is successfully rescued after over a year of evading our rescue attempts. Under sunny blue skies, Evader, along with another sea lion and some elephant seal buddies, were released back to the ocean at Point Lobos in Monterey County. A perfect birthday present for any sea lion! Find out more about the upcoming 23 millionth birthday of California sea lions and read the rest of Evaders amazing story below! Evader returns to the wild on June 10 at Point Lobos. An entangled California sea lion, nicknamed "Evader", lies on a dock at PIER 39, his entanglement clearly showing. Evader, a California sea lion found entangled in fishing net, has been "evading" our attempts to rescue and help him for a year and a half. After numerous calls from the public, this feisty juvenille sea lion was finally captured at PIER 39 on May 30, 2012 after an exciting rescue attempt by the Center's trained staff and volunteers. The challenge for rescuing an entangled animal is that the animal quickly becomes wise to efforts to catch it. It is not possible to simply sneak up on it and grab it. As a result, we have to resort to extraordinary measures. So when we got a call about Evader on the docks at San Francisco’s famous PIER 39, we knew we’d have a better chance if we first subdued him with a dart gun! Our rescue team had to think through numerous scenarios and create a plan that ensured a safe rescue for both the animal and the humans involved. Darting the animal to sedate it was the best option, and once the tranquilizer took effect the team sprang into action. After being darted the animal jumped into the water, but the rescue team used the PIER 39 boat (thank you PIER 39!) to successfully "net" the animal and scopp him to safety. Entangled California sea lion "Evader" is darted by our trained rescue staff to sedate him before a rescue attempt is made. Entangled California sea lion "Evader" is successfully netted by the Center's Stranding Manager, Shelbi Stoudt, at Pier 39 on May 30, 2012. You'll be glad to know that back at our hospital, our vets anesthetized Evader, conducted a complete health assessment, and removed the monofilament (plastic) netting that was deeply embedded in his neck. Skin and scar tissue had overgrown the net in many places, but there were also areas where the net protruded from the infected skin - a very nasty injury indeed. Results of complete blood count and serum chemistry tests are pending, but for now his condition is serious but stable. One of our animal care volunteers, Petra Mottishaw, took the following clip from the surgery (thank you Petra!). **WARNING** Graphic images contained in the following video. Almost 10% of our animals are entangled in trash - pledge to Stop Trashing Our Oceans today! 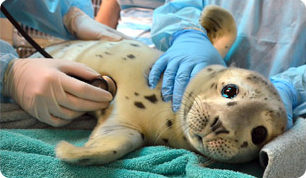 Adopt-a-Seal today and support future patients in our care!